Our family doesn’t regularly make it a point to stop what we’re doing and watch the nightly sunset. Once in a while, we’ll notice the splashes of orange and pink in the sky; we’ll come to the window and admire for a moment or two before continuing on with our nightly routines. 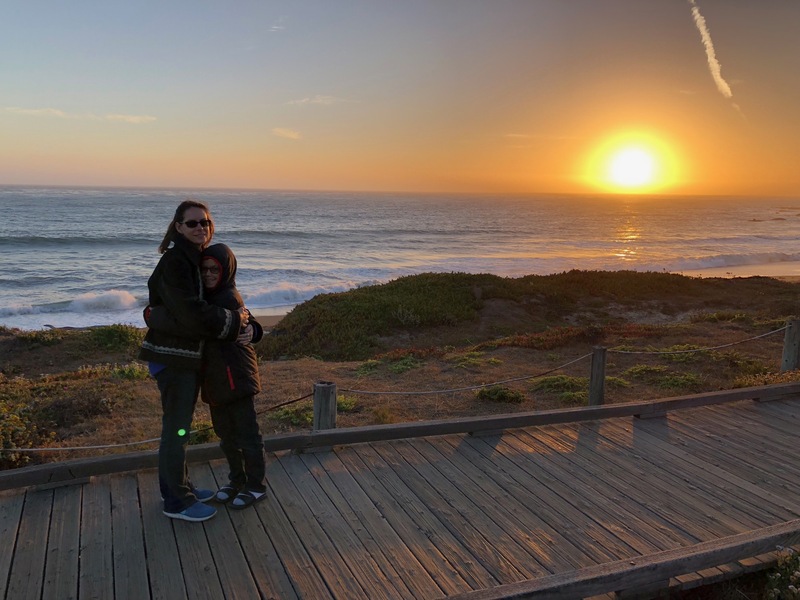 But in Cambria, people do regularly stop and watch and marvel at the sunset. We were there recently (we go once a year), and on our first night there, we weren’t granted much of a show. The day had been extremely foggy, and most of the sunset was hidden from view. But on our second and final night, we were gifted with a glorious show. The temperature had dropped considerably (my son was quite entertained by my chattering teeth), but the cold was well worth it. On that note, I’d like to encourage my readers to try and make a point of witnessing a sunset. It’s important to stop and stand in awe of the beauty that surrounds us. It really does help put things in perspective. If perhaps the view from your home isn’t the best, then click here and take a look at a post I wrote last year for MomsLA.com for a list of some fantastic sunset-viewing spots all around Los Angeles.